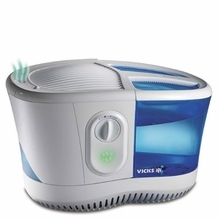 The Vicks V3500 1.2-Gallon Cool Mist Humidifier combines the soothing relief of Vicks with the power of a humidifier. Congestion doesn't stand a chance when it's up against this duo. Generations have relied on Vicks Vapor Therapy to relieve cold and flu symptoms and help them breathe easier. 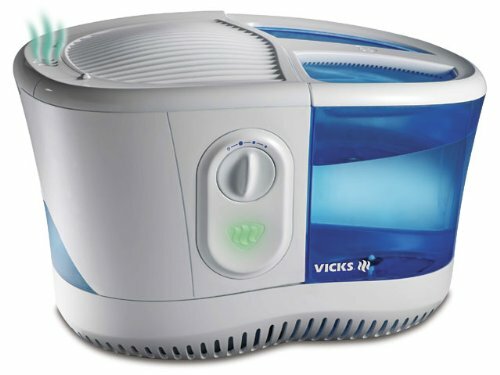 The Vicks V3500 1.2-Gallon Cool Mist Humidifier is no different. It even has an integrated scent pad heater to release more of that soothing relief into the air faster. The V3500 model comes with a sample Vicks Scent Pad and a Kaz WF2 filter. This antibacterial filter removes minerals and pollutants from the water, further ensuring the mist is clean and healthy. The 1.2-gallon tank operates for up to 24 hours on a single filling. Choose from three speeds to achieve ideal humidity levels. The incredibly quiet unit has a removable tank that is easy to clean.